Talent Management Training Materials are designed for trainers to develop human resources capabilities of creating a top-notch talent management program. Confidently train HR staff how to understand talent management, how to identify key talent groups, competency programs, getting the right person for the job and more! Seeing is Believing This sample manual to teach Creating a Top-Notch Talent Management Program is in MS Word format. An organization’s most valued assets are its people, so it’s important to take care of them! For trainers who want to teach the importance of talent management, as well as how to create a talent management program for the workplace, Velsoft’s training material has been designed to be customizable and comprehensive. Talent Management Training Materials includes topics such as succession planning, talent management plans, benchmarking, identifying high potential candidates, and much more. 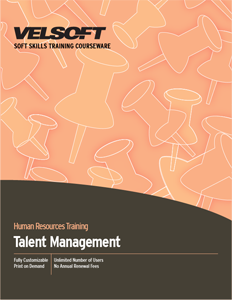 Talent management Training Materials covers strategies, including top techniques for talent management, in a format that is easily customizable, or ready to use immediately and meets the needs of any classroom. Velsoft’s training material is similarly ideal for instructors who are looking for trainers who want to offer even more through Velsoft’s eLearning website, combining classroom instruction with web-based blended learning solution.